Web publishing systems have to take into account a plethora of Web-enabled devices, user preferences and abilities. Technologies generating these presentations will need to be explicitly aware of the context in which the information is being presented. Semantic Web technology can be a fundamental part of the solution to this problem by explicitly modeling the knowledge needed to adapt presentations to a specific delivery context. We propose the development of a emphSmart Stylelayer which is able to process metadata that describes content and use this metadata to improve the presentation of the content to human users. In the paper, we derive the requirements of such a Smart Style layer by considering Web design from both the document engineering and graphic design perspectives. In addition, design trade-offs made by human designers have to be taken into account for the automated process. After stating the requirements for a Smart Style layer, we discuss to what extent the currently available Web technology can be used and what its limitations are. The limitations are illustrated with examples of potential future extensions. 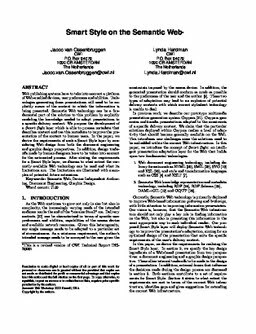 van Ossenbruggen, J.R, & Hardman, L. (2002). Smart Style on the Semantic Web. In Proceedings of Semantic Web Workshop 2002 (WWW 0).